Missional Marketing is a Christian marketing firm that helps churches, schools, and businesses with online advertising and marketing. We believe that every Christian organization has a role in the Great Commission and we strive to help them shine Christ’s light through their online and social media channels. 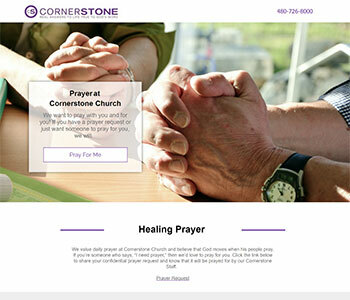 With our church landing pages, we tailor the content of each landing page to address a different felt need or ministry. This has a huge benefit to your website and its visitors, as it increases engagement and click-through-rates (CTR). It also helps your website’s SEO as the content being delivered is relevant to each individual searcher. 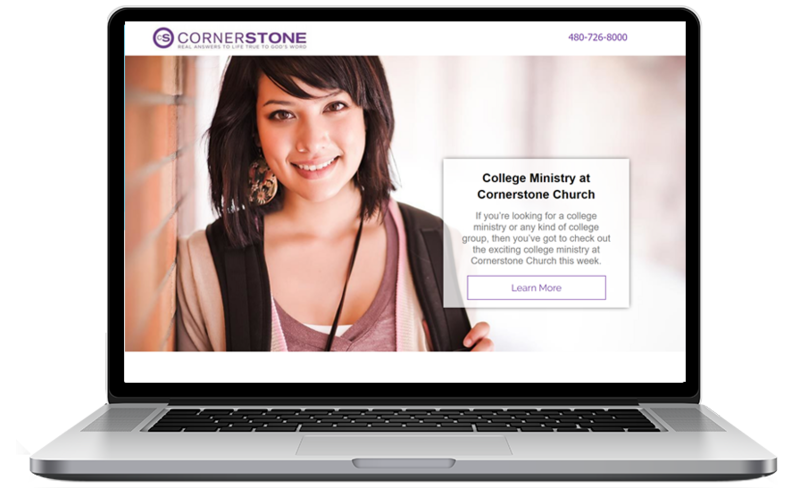 Optimized church landing pages are a vital part of any church’s digital strategy. When people are searching for answers online, they could be looking for the answers to any number of questions. These questions could relate to any of their felt needs, such as crisis support, marriage support, parenting support, community outreach, serving, youth activities, grief care, addiction recovery, Bible study, nearby churches, or personal finance. There is no one size fits all answers to such questions, so it doesn’t make sense to deliver all these different people to the same homepage. This is where church landing pages come in. There are a number of benefits to deploying our optimized church landing pages on your site. First and foremost, our church landing pages are designed to load fast. This means that a visitor is not left waiting for the content to load. Slow-loading content is the number one reason people will navigate away from your site. Each church landing page is optimized to a focus keyword. This means there are no mixed content or message content problems that commonly arise when you want to rank a single web page for multiple keywords. We will maintain the Google Quality Score and ad relevance for the Google Search Campaign. This means there is no need to take the time of the church’s web developer, and no time delays. We try variants to improve CTR and decrease bounces with no need to take the time of the church’s web developer and no time delays. We will perform ongoing analysis of each landing page in real time, to ensure it is performing to its optimum. This will improve CTR and decrease bounce rates, and will not take any of the church’s web developer’s time. The pages are designed with user experience in mind. They are not cluttered, and the call to actions have been positioned to maximize click through rates. As the content is relevant to what a person is searching for, your Google Quality Score will rise, and your ads will perform better. This can also be seen in an improvement in your websites organic search results ranking. 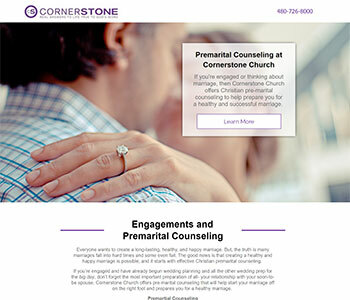 The following are examples of effective church landing pages, ready to be tailored to your church. Our high-quality church landing pages are here to help grow your church ministry. Want to know the SEO score for your church's website? Simply use our free SEO Audit tool to find out. x Does not include annual hosting which is $240 (Billed separately). We’re ready to help your church and church ministries succeed in every way possible! 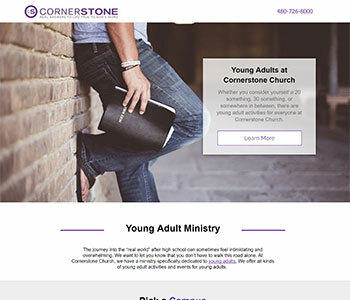 Your church can choose from our large library of landing pages or we can customize one to meet your specific needs. 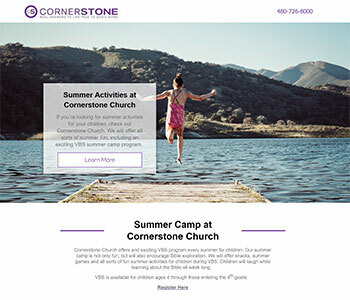 All landing pages will be personalized with your church’s logo, but if you’re looking for specific design elements a custom landing page may be your best option. Your church can choose from our large library of landing pages. Each landing page has been built for maximum effectiveness based on specific keywords. These pages have a proven track record of improving web traffic to your church and church ministry. 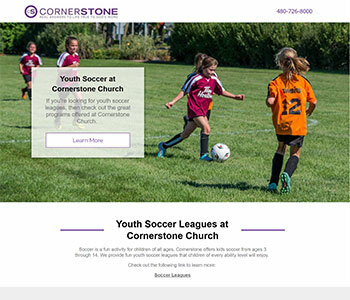 All landing pages will be personalized with your church’s logo. They’re compelling and ready to help your church church ministry grow. People’s stories stick in our mind and memory like glue and influence our emotions in many ways. 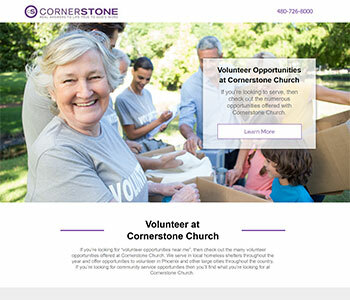 This landing page makes it easy for your church to collect stories and testimonials from individuals in your congregation. Once the videos are collected they are then edited into short videos for Facebook and Google online advertising. This landing page makes it easy to collect ministry promotional videos from your church staff and volunteers that encourage individuals who like your Facebook page to connect, give, or serve. Once the videos are collected they are edited into short videos for Facebook and Google online advertising.